Writing about pot roasts, I mentioned that a long slow simmer is more traditional in some parts of the world than others. For it to make sense, you needed both cold weather and plentiful fuel – both common in Northern Europe. Asia is different. Some areas of course are simply too hot to keep a fire burning all day – but others just don’t have the fuel, even if they have the cold weather. The traditional Japanese approach, for instance, is to heat the body, not the room. No big fires, but a small charcoal burner under a table, with everyone sitting around it to keep warm, wrapped up in heavy clothing and drinking hot tea – very cozy. These days, of course, most Japanese, like most Europeans and Americans, don’t count on the traditional methods of keeping warm, but it still influences the culture – and what sounds good on a snowy day. I was looking, a while ago, at a book about Japanese hotpot cooking, which is very popular home cooking. The ideal is to have a pot on a burner in the middle of the table where everyone can reach it, full of broth bubbling away. 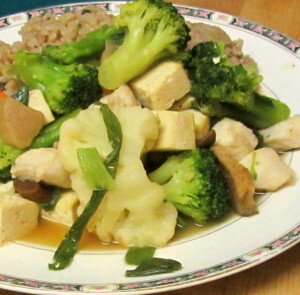 Then either the cook adds a series of quick cooking ingredients, and then serves bowls of the simmered food, or there are plates of thin sliced meats, vegetables, and tofu for everyone to cook their own. All the food simmering further enriches the stock, and at the end, either rice or noodles are added to the broth, and it is served as a soup. I’ve had shabu shabu, which is a version of the second method, in a restaurant and liked it – someday I’d like to try it at home. That said – this is not a Japanese hotpot… Not just because I didn’t cook it on the table (which is optional, even in Japan) but because I changed up ingredients and methods. 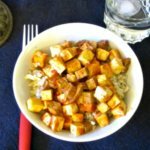 It is, however, inspired by the idea… a quick simmered, hot, flavorful meal, using a mixture of ingredients. It is closer to the first version, as I put everything together and let it all cook at the same time, for just a few minutes, and then served. All of this makes a good, fast, warming meal. I began, really, with a fish filet. Yes, I’m near the coast, yes, I can get wonderful fresh fish from the fisherman at Greenmarket – but I do also sometimes buy the cheap imported frozen white fish at the supermarket, because if I have something in my freezer, I’m more likely to actually use it. And I’m trying to cook fish more often than I have been. So, anyhow, I had this frozen filet of white fish that might have been tilapia (and might have been something else… it is no longer in its original package, and I didn’t label it) which wasn’t enough alone for a meal for the two of us. And I had a package of tofu. I haven’t written about it much lately, but we do still eat it… This was a 15 oz. package, so half of that with the fish would add up nicely to a full meal. 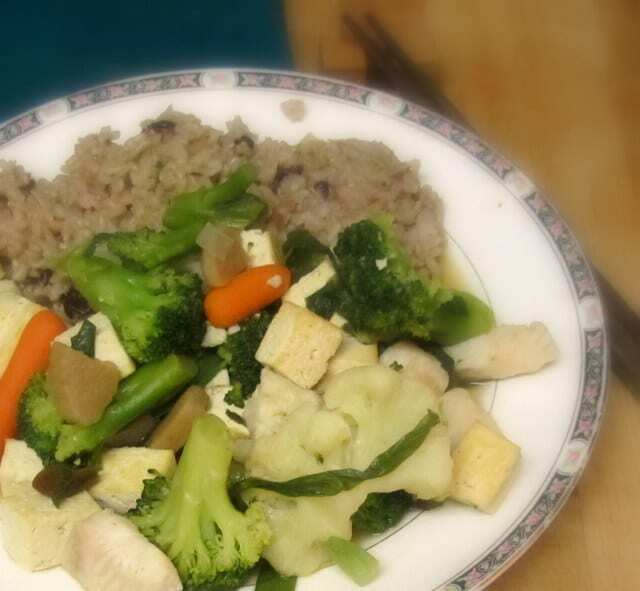 And then, well – the weather has been bad, and I haven’t been out much, and I didn’t feel well, so frozen vegetables it was… a broccoli/cauliflower/carrot mix. This would all work pretty well for quick and easy. 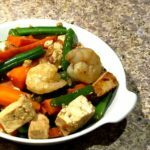 Normally for a Simmered Tofu, or a hotpot, you would then just cut it in bite sized pieces and simmer it – but we like it even firmer, so I decided to go ahead and brown it. This step is purely optional – but if you have ever complained that tofu is too soft, try it… I heated just a bit of oil in a pan, then put in the small pieces. And then – crucial step – I left them alone… See, the tofu sticks to the bottom of most pans at this point, and if you try to stir it, it will tear. If you leave it alone, though, in a few minutes it will form a thin golden crust on the bottom, that completely releases… just gives you a little crunch and texture contrast. If you are really determined, you can repeat the process for the other sides – I don’t usually bother. Anyhow, I then removed the tofu from the pan and reserved it. Again, you can skip this step if you’re in a rush – or do it in advance. I brought the chicken and mushroom stocks, with the mushrooms, to a boil in the pan I’d used for the tofu. 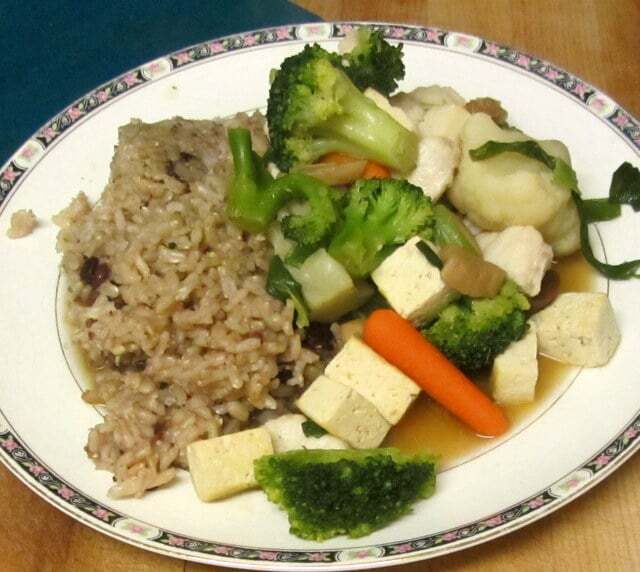 I added 1 Tablespoon of soy sauce (the San-J Tamari for me, now, of course) and 2 teaspoons of ginger paste from a jar. I love using fresh ginger, but I don’t always use it fast enough – and it’s been hard to find here lately. The jar means I always have it, and can use it when I want something quick. I have dried ginger, but it loses flavor so quickly… much more so than even other dried spices, I prefer this. 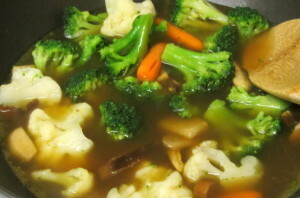 When the stock came to a boil, I added the frozen mixed vegetables, and heated them until just thawed. Then I added scallions – I actually have frozen chopped scallions, because we suddenly got a lot of them from the CSA at the end of the season, and I froze some, but I know most people don’t have that – it would be the equivalent of 2 scallions… If I didn’t have scallions I would probably skip onion – I wouldn’t have wanted to fool around with browning one earlier. After the scallions, I added the tofu and the fish. 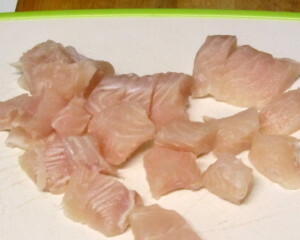 The other ingredients lowered the heat in the pan, so the fish could cook slowly and evenly without falling apart. 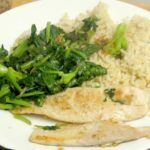 I then cooked this for just a few minutes – paying m ore attention to the fish than to the clock. Now, if I were being traditional I would then have served all this in a bowl, with all the liquid, as a rather soupy combination.Or I’d have served the solids, then added rice to the liquid and proceeded as above. Instead, I served the solids with rice cooked with azuki beans and enough liquid to moisten – I kept the rest of the simmering liquid and used it in a soup the next day. Do whatever makes sense for you! A quick, warming meal, inspired by the Japanese Hotpot. 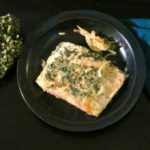 Tofu and fish simmered in a flavorful broth cooks in minutes. Wrap the tofu in a clean towel to drain. Break up the dried mushrooms and soak them in the cup of water. 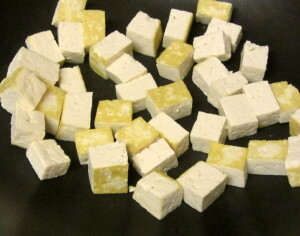 Cut the tofu into bite sized pieces. If you choose, heat oil in a pan, and brown the tofu until golden. Remove and reserve.